F,ditor's note: "Who's This?" is a weekly feature in which we profile local people with interesting jobs, hobbies or personalities. Picture tennis star Andre Agassi's backhand, and you'll likely envision a bald guy with the most dangerous serve return in the game. When Dr. Gideon Ariel shows Agassi's trademark swing on a computer, it comes up in a complex graph of force, velocity and acceleration. Next, he pulls up a moving stick figure representing the very same swing, followed by actual footage of Agassi. It all goes back to physics. This is what Ariel sees when he looks at an athlete in motion. Ariel is one of the world's leading experts in biomechanics, a field that applies the laws of physics to body movement. 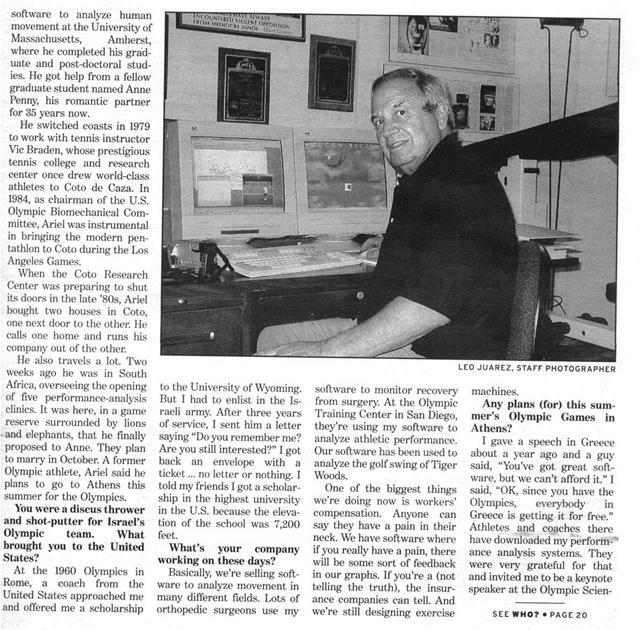 In 1968, he invented the first computerized system to analyze the performance of Olympic athletes, such as the motion and position of a discus thrower's body a split-second before release. Soon after, he founded Ariel Dynamics to develop products based on his work. Of the company's 19 patents, one is for variable resistance, the basis for most modern exercise equipment. Ariel first began writing software to analyze human movement at the University of Massachusetts, Amherst, where he completed his graduate and post-doctoral studies. He got help from a fellow graduate student named Anne Penny, his romantic partner for 35 years now. He switched coasts in 1979 to work with tennis instructor Vic Braden, whose prestigious tennis college and research center once drew world-class athletes to Coto de Caza. In 1984, as chairman of the U.S. Olympic Biomechanical Committee, Ariel was instrumental in bringing the modern pentathlon to Coto during the Los Angeles Games. When the Coto Research Center was preparing to shut its doors in the late '80s, Ariel bought two houses in Coto, one next door to the other. He calls one home and runs his company out of the other. He also travels a lot. Two weeks ago he was in South Africa, overseeing the opening of five performance-analysis clinics. It was here, in a game reserve surrounded by lions and elephants, that he finally proposed to Anne. They plan to marry in October. A former Olympic athlete, Ariel said he plans to go to Athens this summer for the Olympics. You were a discus thrower and shot-putter for Israel's Olympic team. What brought you to the United States? At the 1960 Olympics in Rome, a coach from the United States approached me and offered me a scholarship to the University of Wyoming. But I had to enlist in the Israeli army. After three years of service, I sent him a letter saying "Do you remember me? Are you still interested?" I got back an envelope with a ticket ... no letter or nothing. I told my friends I got a scholarship in the highest university in the U.S. because the elevation of the school was 7,200 feet. What's your company working on these days? Basically, we're selling software to analyze movement in many different fields. Lots of orthopedic surgeons use my software to monitor recovery from surgery. At the Olympic Training Center in San Diego, they're using my software to analyze athletic performance. Our software has been used to analyze the golf swing of Tiger Woods. 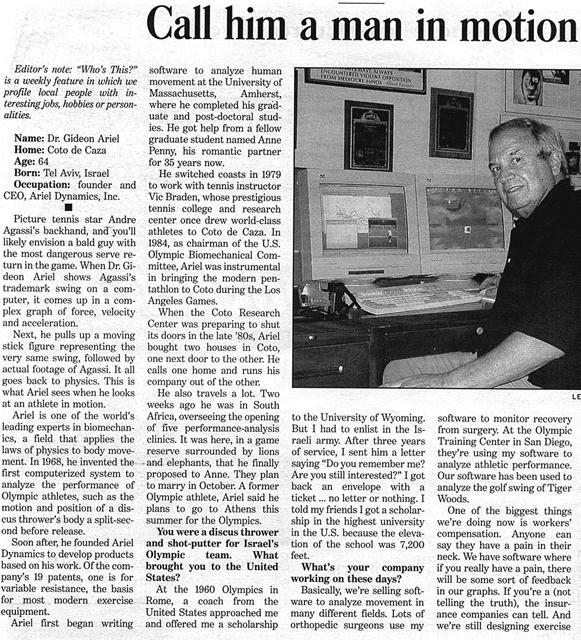 software to analyze human movement at the University of Massachusetts, Amherst, where he completed his graduate and post-doctoral studies. He got help from a fellow graduate student named Anne Penny, his romantic partner for 35 years now. He switched coasts in 1979 to work with tennis instructor Vie Braden, whose prestigious tennis college and research center once drew world-class athletes to Coto de Caza. In 1984, as chairman of the U.S. Olympic Biomechanical Committee, Ariel was instrumental in bringing the modern pentathlon to Coto during the Los Angeles Games. When the Coto Research Center was preparing to shut its doors in the late '80s, Ariel bought two houses in Coto, one next door to the other. Ile calls one home and runs his company out of the other. One of the biggest things we're doing now is workers' compensation. Anyone can say they have a pain in their neck. We have software where if you really have a pain, there will be some sort of feedback in our graphs. If you're a (not telling the truth), the insurance companies can tell. And we're still designing exercise machines. Any plans (for) this summer's Olympic Games in Athens? tire Congress in Athens in August. Plus, the International Track and Field Coaches Association asked me to be involved in analyzing the athletic events in Greece, which I've done in every Olympics since Munich in '72. Today, we're doing everything through the Internet so when we collect the data it will be transferred to many universities in the United States and other countries. How has the science of biomechanics changed in the past decade? The science hasn't changed because you're still using Newtonian physics. The formulas didn't change. What changed is the technology. When I was here with Vie Braden in the '80s, it would take us days to analyze one swing of a tennis racket. It used to be 16-millimeter film. Then video came so it was a little easier. And then the PC came, but you'd still have to capture the frames from the VCR and transfer them to a hard drive. Now I take it directly from digital cameras. What used to take two hours takes five minutes. We're doing things today that we couldn't do before. 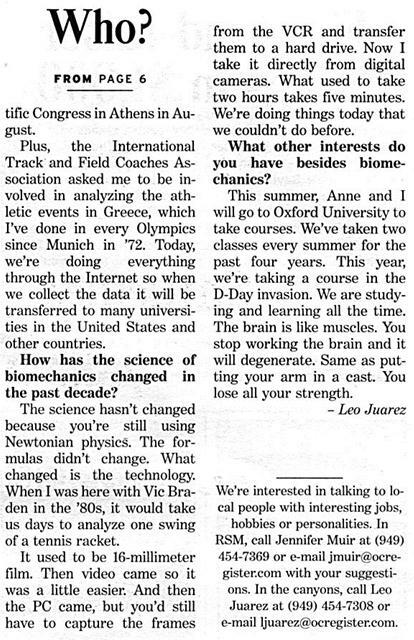 What other interests do you have besides biomechanics? This summer, Anne and I will go to Oxford University to take courses. We've taken two classes every summer for the past four years. This year, we're taking a course in the D-Day invasion. We are studying and learning all the time. The brain is like muscles. You stop working the brain and it will degenerate. Same as putting your arm in a cast. You lose all your strength. Generated on 4/20/2019 12:06:26 PM (PST) ADI/HQ/GBA/2019/ARIELCLOUD/v3.0.2018.0126.